Jim Corbett National Park is the oldest national park in India,] named after the hunter-turned-conservationist Jim Corbett who played a key role in its establishment—was established in 1936 as Hailey National Park. Situated in Nainital district of Uttarakhand the park acts as a protected area for the endangered Bengal tiger of India, the secure survival of which is the main objective of Project Tiger, an Indian wildlife protection initiative. The park has sub-Himalayan belt geographical and ecological characteristics. An ecotourism destination, it contains 488 different species of plants and a diverse variety offauna. The increase in tourist activities, among other problems, continues to present a serious challenge to the park's ecological balance. Corbett has been a haunt for tourists and wildlife lovers for a long time. Tourism activity is only allowed in selected areas of Corbett Tiger Reserve so that people get an opportunity to see its splendid landscape and the diverse wildlife. In recent years the number of people coming here has increased dramatically. Presently, every season more than 70,000 visitors come to the park from India and other countries. The Jim Corbett National Park is a heaven for the adventure seekers and wildlife adventure lovers alike. 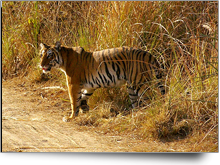 Corbett National Park is India's first national park which comprises 520.8 km2. area of hills, riverine belts, marshy depressions, grass lands and large lake. The elevation ranges from 1,300 feet (400 m) to 4,000 feet (1,200 m). Winter nights in Corbett national park are cold but the days are bright and sunny. It rains from July to September. Dense moist deciduous forest mainly consists of sal, haldu, pipal, rohini and mango trees, and these trees cover almost 73 per cent of the park. The 10 per cent of the area consists of grasslands.It houses around 110 tree species, 50 species of mammals, 580 bird species and 25 reptile species. The endangered Bengal tiger of India resides here. The sanctuarywas the first to come under Project Tiger initiative. Some areas of the park were formerly part of the princely state of Tehri Garhwal. The forests were cleared to make the area less vulnerable to Rohilla invaders. The Raja of Tehri formally ceded a part of his princely state to the East India Company in return for their assistance in ousting the Gurkhas from his domain.The Boksas—a tribe from the Terai—settled on the land and began growing crops, but in the early 1860s they were evicted with the advent of British rule Efforts to save the forests of the region began in the 19th century under Major Ramsay, the British Officer who was in-charge of the area during those times. The first step in the protection of the area began in 1868 when the British forest department established control over the land and prohibited cultivation and the operation of cattle stations. In 1879 these forests were constituted into a Reserve Forest where restricted felling was permitted. In the early 1900s several Britishers, including E. R. Stevans and E. A. Smythies, suggested the idea of setting up of a national park on this soil. The British administration considered the possibility of creating a game reserve there in 1907. It was only in the 1930s that the process for demarcation of such an area got underway, assisted by Jim Corbett, who knew the area well. A reserve area known as Hailey National Park covering 323.75 km2 (125.00 sq mi) was created in 1936 when Sir Malcolm Hailey was Governor of United Provinces, and Asia's first national park came into existence. Hunting was not allowed in the reserve, but only timber cutting for domestic purposes. Soon after the establishment of the reserve, rules prohibiting killing and capturing of mammals, reptiles and birds within its boundaries were passed. The reserve was renamed in 1954–55 as Ramganga National Park and was again renamed in 1955–56 as Corbett National Park. The new name honours the well-known author and wildlife conservationist Jim Corbett who played a key role in creating the reserve by using his influence to persuade the provincial government to establish it. The park fared well during the 1930s under an elected administration. But during the Second World War, it suffered from excessive poaching and timber cutting. Over time the area in the reserve was increased—797.72 km2(308.00 sq mi) were added in 1991 as a buffer for the Corbett Tiger Reserve. The 1991 additions included the entire Kalagarh forest division, assimilating the 301.18 km2 (116.29 sq mi) area of Sonanadi Wildlife Sanctuary as a part of the Kalagarh division. It was chosen in 1974 as the location for launching Project Tiger, an ambitious and well known wildlife conservation project. The reserve is administered from its headquarters in the district of Nainital. Corbett National Park is one of the thirteen protected areas covered by World Wildlife Fund under their Terai Arc Landscape Programme. The programme aims to protect three of the five terrestrial flagship species, the tiger, the Asian elephant and the Great One-horned Rhinoceros, by restoring corridors of forest to link 13 protected areas of Nepal and India to enable wildlife migration. Though the main focus is protection of wildlife, the reserve management has also encouraged ecotourism.In 1993, a training course covering natural history, visitor management and park interpretation was introduced to train nature guides. A second course followed in 1995 which recruited more guides for the same purpose. This allowed the staff of the reserve, previously preoccupied with guiding the visitors, to carry out management activities uninterrupted. Additionally, the Indian government has organised workshops on ecotourism in Corbett National Park and Garhwal region to ensure that the local citizens profit from tourism while the park remains protected. Patil & Joshi (1997) consider summer (April–June) to be the best season for Indian tourists to visit the park while recommending the winter months (November–January) for foreign tourists. According to Riley & Riley (2005): "Best chances of seeing a tiger to come late in the dry season- April to mid June-and go out with mahouts and elephants for several days. As early as 1991, the Corbett National Park played host to 3237 tourist vehicles carrying 45,215 visitors during the main tourist seasons between 15 November and 15 June. This heavy influx of tourists has led to visible stress signs on the natural ecosystem. Excessive trampling of soil due to tourist pressure has led to reduction in plant species and has also resulted in reduced soil moisture. The tourists have increasingly used fuel wood for cooking. This is a cause of concern as this fuel wood is obtained from the nearby forests, resulting in greater pressure on the forest ecosystem of the park. Additionally, tourists have also caused problems by making noise, littering and causing disturbances in general. In 2007, young naturalist and photographer – Kahini Ghosh Mehta – took up the challenge of promoting healthy tourism in Corbett National Park and made the first comprehensive travel guide on Corbett. The film titled – Wild Saga of Corbett – showcases how tourists can contribute in their own small way in conservation efforts. The film is loaded with all information needed by a tourist before planning a visit to the park along with tips from senior park officials, nature guides and naturalists. Tourists can get a DVD copy of this film from the Bombay Natural History Society (BNHS). Dhikuli is a well known destination in the ark and situated at the fringes of Patli Dun valley. There is a rest house, which was built hundred of years ago. Kanda ridge forms the backdrop, and from Dhikala, one can enjoy the spectacular natural beauty of the valley.